Strategic intelligence (SI) has mostly been used in military settings, but its worth goes well beyond that limited role. It has become invaluable for improving any organization's strategic decision making process. 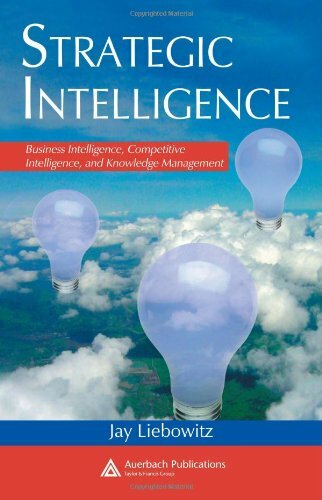 The author of Strategic Intelligence: Business Intelligence, Competitive Intelligence, and Knowledge Management recognizes synergies among component pieces of strategic intelligence, and demonstrates how executives can best use this internal and external information toward making better decisions. Divided into two major parts, the book first discusses the convergence of knowledge management (KM), business intelligence (BI), and competitive intelligence (CI) into what the author defines as strategic intelligence. The second part of the volume describes case studies written by recognized experts in the fields of KM, BI, and CI. The case studies include strategic scenarios at Motorola, AARP, Northrop Grumman, and other market leaders. Jay Liebowitz, D.Sc., is a full professor in the Graduate Division of Business and Management and program director for the Graduate Certificate in Competitive Intelligence at Johns Hopkins University. The first knowledge management officer at NASA Goddard Space Flight Center, he also served as the Robert W. Deutsch Distinguished Professor of Information Systems at the University of Maryland-Baltimore County, professor of Management Science at George Washington University, and Chaired Professor of Artificial Intelligence (AI) at the U.S. Army War College. A founder and chairperson of The World Congress on Expert Systems, he is a Fulbright Scholar, IEEE-USA Federal Communications Commission Executive Fellow, and Computer Educator of the Year (International Association for Computer Information Systems). If you have any questions about this product by Brand: Auerbach Publications, contact us by completing and submitting the form below. If you are looking for a specif part number, please include it with your message.